I am in the process of giving my very small bathroom a makeover. It’s been almost 8 years since we did a full renovation, and although the colour has been changed once since then, not much else has. It’s looking tired, a little dated and in need of a some care. I loved what Antonia from Tidy Away Today did to her bathroom recently, transforming it into a spa like haven with a lick of paint and a few new storage baskets. Who would have thought removing the cupboard doors would make such a difference? It’s a great idea. However, the problem on my mind, is how to decorate a small bathroom. So, it’s time our bathroom had a lick of paint and mini makeover. But what’s the best way to decorate a small bathroom? It’s the smallest room in the house, where we can just fit a good-sized bath, a slim loo and a floating sink unit. There’s little floor space for towel rails or storage units so what we do have needs to go on the wall. Now the girls are older we don’t need so many toys around, but we have more toiletries that we have space for so I need to be inventive with the storage solutions. This has to be the number 1 priority for a small bathroom, just as it is for any other small room in the house. Look upwards and use the walls. There are lots of great storage units about on the high street, but even use shelves with storage baskets for all of those toiletries and loo rolls. Look around for the best bathroom cabinet; I’m looking for something tall and thin that takes up minimal space. Adding towel storage is a great way to add colour into the room too, with artfully displayed, colourful towels. Remember, darker colours bring the room towards you, lighter ones push it away. Don’t think everything has to be white though. 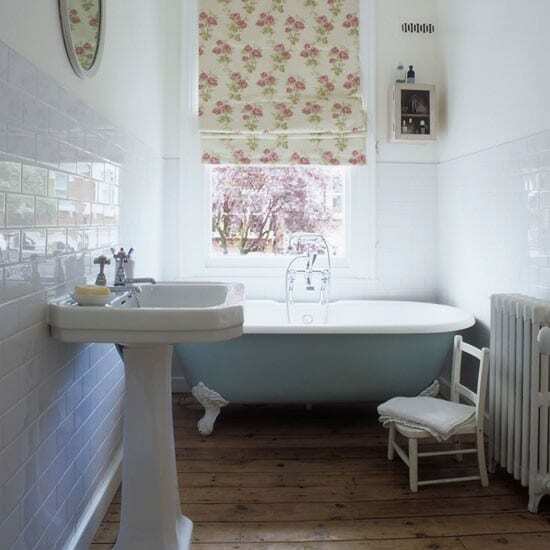 There are some lovely paler shades that would suit the smaller bathroom, and pastels are very big this season. I’ve been trying out some new ochre and fennel shades, but as lovely as they look in the tin, they don’t work well in my small bathroom. The light isn’t right and they just look dirty and dull. It’s so important to try a tester pot and try the colour on the wall first. You never know how it’s going to look in the different light. Not everyone likes a minimal home, and it doesn’t work for all families. 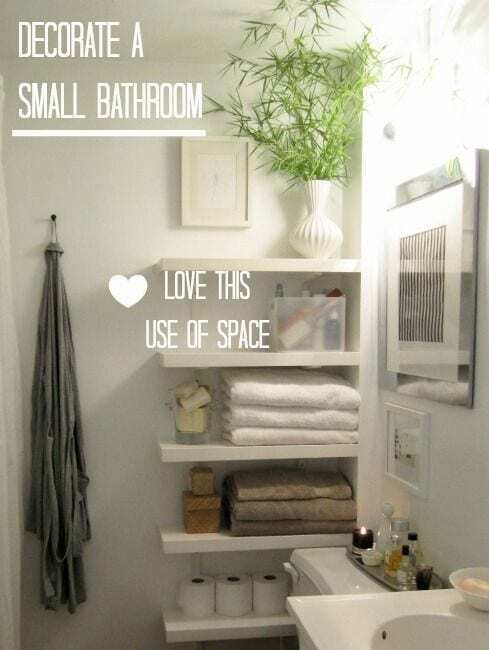 However, if space is tight you will make the room feel bigger if you can keep bathroom accessories to a minimum. 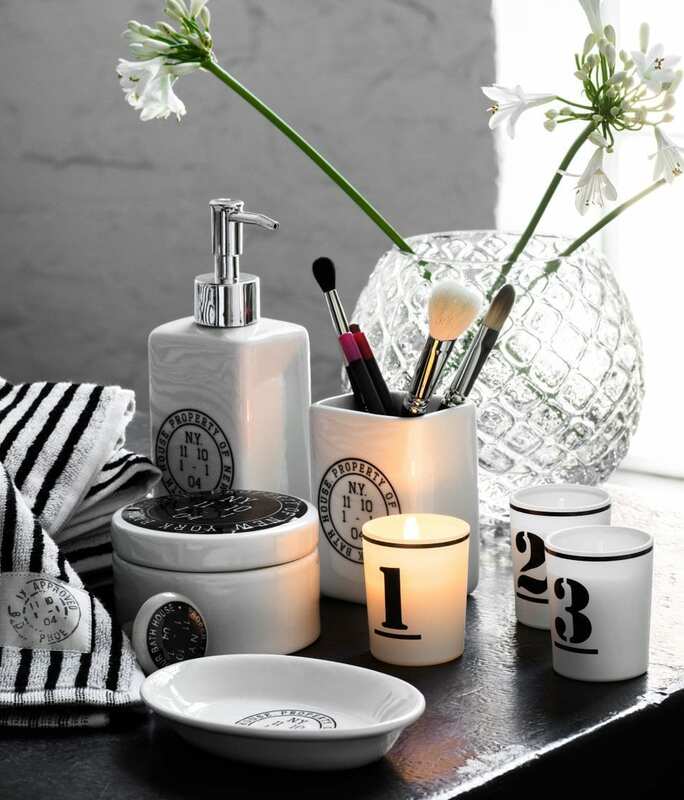 Clearing the clutter and keeping everything in its right place, will give the bathroom a greater sense of space. I’ve found some wonderful accessories which I’m coveting at H&M. They’re so pretty and attractive, and would look stunning on pastel backdrop we mentioned above. By this I mean, don’t have too many big and bold features in the room, competing for your eye. If the room is small, you just need one or two key pieces that draw your eye in. Too many and the room will feel too busy and cluttered. As in the image above, your eye is drawn to the pretty blind, which co-ordinates beautifully with the soft colours. Using this trick will help the room feel bigger. When space is limited, it’s really important to research and plan how you’re going to use it. Using floating units, as in the image above will allow the eye to wander further back to the wall, so giving the illusion of great space. The more floor the eye can see, the more it is tricked into thinking the room is bigger. Plus units like this look so much neater. Using the glass shower door to bounce a reflection into the mirror is another great trick to increasing the illusion of space. So with all these how to decorate a small bathroom tips, I’m really hoping I can give my bathroom a lovely little makeover. I’m looking for a colour at the moment. Anyone have any suggestions? I love the use of space in the top photos and I am loving the bathroom from House to Home. This is our next project – bathrooms aren’t that expensive its the cost of the labour to have them fitted that can bump the price up a lot. I like neutral bathrooms, would you go with a bold colour? I agree, you can get some great deals on bathroom suites now, but the labour can mount up. A bold colour, perhaps, but it’s so small if feels very intense then. I’m drawn to a chalky neutral shade, but the rest of the family aren’t keen! Jen, I really enjoyed this post. The idea of using towels to decorate the bathroom is brilliant. My bathroom is white and I can’t paint it, so any idea for make it a little bit less dull is welcomed. Thank you for inspiration! I think that blues and greys combine well together. Can you imagine your bathroom in these colors? The storage idea is really nice, and stylish too! 🙂 I think, like you said with ‘minimal accessories’, reducing clutter is a brilliant starting point for making it feel bigger! I have a tiiiny bedroom and I know it feels way bigger when I have more space on my surfaces! Hi Jen, I’m just catching up on some overdue reading – thanks so much for the mention 🙂 Some great tips here, too. The use of vertical space makes so much sense and it goes to show you can still do a lot even with a small space. Good luck with your own mini makeover! What a great decor inspiration realy thanks for that! Your post on “How to Decorate a Small Bathroom” was really awesome. All the ideas was amazing and easily to apply. I have also a small bathroom but I can’t understand how I give it a good look but after reading this post I understand all the tips that I will apply on my bathroom so that I will use it space properly and it looking stylish too. I big thanks for all the tips that you are sharing. The master bedroom is usually the largest size among all the other rooms. Homeowners spend lots of time and cash to decorate their homes, but for some reason, they tend to neglect their own room. If your bedroom contains the essential things but lacks warmth, there is a quick and easy way to give an impulse such as painting, accessories and bedroom furniture. 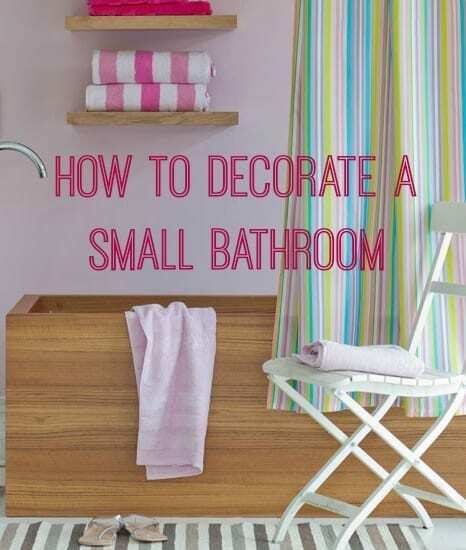 very nice tips to decorate small bathroom.Thanx for sharing these useful ideas. Love the storage ideas perfect for small spaces. I think greys and blues go well for a bathroom it depends on your style if you want soft and relaxing spa or more modern and crisp. Great tips. #5 is the most important in my opinion.